You may be surprised if you were told that the hardest working joint in the body is the jaw or the temporomandibular joint (TMJ). It is virtually constantly working when talking, chewing, grinding and clenching and there are estimates that it moves more than a couple of thousand times every day. It is no surprise then that some of the muscles used to move the joint can become a little overworked and sore. The outcome is often that the TMJ dysfunction sufferer has poor quality sleep, is constantly in pain or discomfort and a general degradation of their quality of life. It is not uncommon that these problems can be related to trigger points in the muscles that move the jaw and, although there are a number that can be affected including the masseter and the temporalis, one of the main culprits is often the pterygoid muscles. The good news is though that it is relatively easy to massage these muscles yourself so long as you know where to work. The origin of the term pterygoid is Greek and the root of the word, pter-, refers to wing like (as in pterodactal) which is considered to reflect the shape of the muscles. 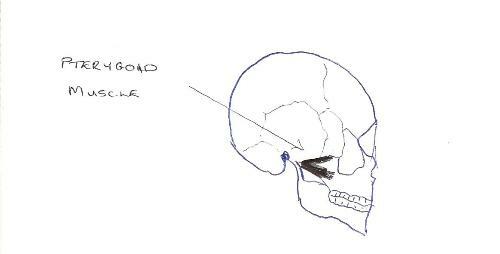 The group consists of the medial and lateral pterygoids each of which have their own recognised trigger point referral pattern. If there are trigger points present in the medial pterygoids then the person will often have pain in the TMJ and also around the ear. It can also be difficult to swallow with pain referred to the back of the mouth. If you have restrictions in how far you can open your mouth then there is likelihood that you will have trigger points in this muscle, normally present on both sides of the head. In order to self-massage the trigger points then you simply press up on the inside of the lower edge of the jaw using your thumb. As with any massage, then it is advisable to go gently at first as often the jaw can be extremely sensitive at these points. The most effective way to reach the upper fibres of the medial pterygoid is through the mouth. With clean hands, reach into the very back of the mouth beyond the final molar. Work on the muscle just beyond the bony edge of the jaw (open and close the mouth to locate the muscle if required). This muscle is considered by many to be the leading culprit for pain and TMJ dysfunction. For example, if you have clicking and discomfort on opening and closing the mouth then you may have trigger points in the lateral pterygoid. Constant tension in these muscles can lead to the jaw being disarticulated. To locate this muscle, then commence just in front of the ear on the cheekbone. Press on the underside of the cheekbone whilst opening and closing your mouth. A couple of centimetres from the ear you will often hit pay dirt with a tight tender band going up under the cheek bone. This is the lateral pterygoid and gently massage this muscle until the pain and tension has reduced. Any time you massage trigger points in muscle groups it is a good idea to stretch them out afterwards to enhance the relaxation of the muscle. One recommended stretch for these muscles is to open your mouth against resistance by placing your hand under your chin while you slowly open the mouth against the resistance. Often you will need to repeat this self-massaging a couple of times a day for a number of days to completely eliminate the trigger points in the group. If you are a TMJ dysfunction sufferer though, the time taken to do this will be well worth the effort as the pain relief can be significant. More info on pterygoid trigger point massage is available on the video below.